Several months ago we took a trip to the Museum of Natural History with our girls. During our time there I grew more and more irritated looking at what my tax dollars were paying to teach other children. Watching people gape at a little bronze rat, 'our earliest ancestor', made me sick to my stomach and I returned home with a renewed passion to instill a deep understanding of Creation and a love for its Creator in our children. I asked a friend of mine about different science curriculums and she recommended the Young Explorer Series from Apologia to me. Before I even had a chance to do much research on the company, I received their book Flying Creatures on the Fifth Day to review - a complete and total blessing! We started working through the book a few weeks later and can say that this is a curriculum series we will continue to use in the years to come. "...children will begin exploring the dynamics of flight and animal classification, understanding why the design we see in these incredible creatures points us to our Creator God. Then, get ready for the exciting adventure of learning about birds. Your children will learn how to attract various bird species to your yard and identify them by looking at their special physical characteristics, diverse nests, and interesting domestic practices. They will also learn the anatomy and the glorious design that enables birds to do remarkable things. After becoming amateur ornithologists, your children will explore the world of chiropterology, which is the study of bats." Flying Creatures provides 14 lessons packed full of information (you can view lesson one here). The lessons can seem overwhelming at first, but they recommend breaking each chapter/lesson up into segments. Once lesson one is completed you can continue with the remaining lessons in any order you choose. If the weather is warm in your area, you can study insects or whenever it is convenient for you. Our girls were a little overwhelmed when they first saw the book, but we have been slowly working our way through the first chapter and they are picking up so much! We are notebooking and lapbooking along with our learning to record what we have been talking about. Their favorite part has been learning about how animals are classified and learning the meme to go along with the classification system: "Kings play chess on fine glass sets." The first letter in each word matches the first letter in the words of the classification groups: Kingdom, Phylum, Class, Order, Family, Genus, and Species. And you know the girls think they are too smart now that they know all of those! Projects and experiments ~ Each lesson includes different hands-on experiments and projects to do with your children. The experiments generally use common household items. The book provides a list of the items needed for all the experiments for quick reference also. Each lesson generally provides several things to try. Notebooking - Each lesson provides notebooking activities so that your child can keep a record of what they are learning in the lessons. 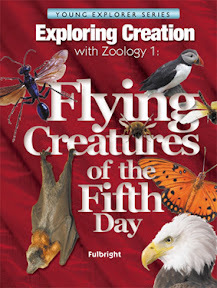 If you would like more information on Flying Creatures of the Fifth Day, there are several pdfs available for viewing online: the table of contents, an introduction to the book, a course overview, notebooking examples, lesson examples, zoology flashcards, and lab information. Apologia also has other books available in the Young Explorers series focused on astronomy, botany, swimming creatures and land animals. There is also a great Yahoo group for Apologia that focuses on the elementary science books by Jeannie Fulbright where I have found some great resources ans answers to questions. If you have older children, be sure to check out the other science options that Apologia offers too. about this book and others available from Apologia. How fortunate that I found your blog through Totally Tots today! I have been trying to pick a science curriculum for next year and have all but ordered this very book. I have held out a little longer just in case I found something else. I do not know anyone who has used this so I am thrilled to read your personal opinions about the book. Thanks! Thank you for sharing this science curriculum with us. I've heard of Apologia, but never had a chance to look at it. It looks great and from such a wonderful and true perspective! I just found your blog last night! :) Love it! We just started Galopping the Globe and are having a blast. I have loved looking at all the projects that you all have done with GTG. we have also been using apologia this year. we are doing the land animals book and absolutely loving it.